Let’s get things straight right from the beginning: a tactical flashlight is no regular flashlight, as it has to come with specific features. Additionally, when you want it even small, it has to compress all its performances in a smaller “package”. When you work as a security/police officer or you’re simply into the challenging outdoor activities (fisherman, hunter, hiker, survivalist), a small tactical flashlight may make the difference between staying alive and…not. Small tactical flashlight present properties that a regular one doesn’t present. It’s not only the rugged build that a small tactical flashlight has, but also multiple functions and features. Let’s not forget that you may actually use this type of flashlight as a self-defense tool, in case of emergencies. It’s essential for a small tactical flashlight to present several light modes (high, medium, low, and strobe) and SOS mode is always a must. It also comes with a beveled edge so that you may use it as a self-defense weapon when in need. Let’s not forget to mention that a small tactical flashlight has to be tough, rugged, compact, and easy to store. This doesn’t sacrifice weight and a good tactical flashlight is supposed to be lightweight as well. It has to have a slip-resistant body and a waterproof casing is the best to have. As for the power, many use small tactical flashlights that run on rechargeable AA or triple AAA batteries. The beam has to be bright, with a good range cover, but also able to give amazing focusing. You may want to temporarily blind the attacker, if that should be the case. Be willing to pay the extra buck for your small tactical flashlight. After all, you can’t put a price on your life. 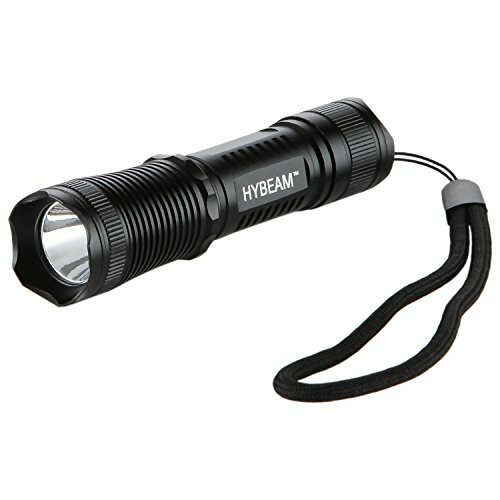 For the customer that goes shopping with just one buck (sort to say), a dependable and very surprising option is the Hybeam Mini Tactical Flashlight with 3 Modes Ultra Bright 300 Lumens Bulb and Waterproof Body. The flashlight isn’t just small, but also reliable and bright, especially considering its price and size. You may actually use one of the three modes, very easy each time. You may choose one of the two brightness settings (a blinding high beam or low beam) or instantly set the strobe mode in case of an emergency. There are plenty of good features on the Hybeam Mini Tactical that impress us. The beveled edge may be used as glass breaker or for safe-defense if the situation requires it. As small as it may be, the flashlight has a compact shape and a rugged build that turns into a lifesaver. The body is made with aircraft grade aluminum so the flashlight takes a few drops. It’s also water resistant and its carrying strap makes it highly portable. As for the costs, the flashlight isn’t just cheap, but also only uses one AA battery, rechargeable or not. The light is very bright and the body is shock-resistant. It fits in your fist when in need and is water-resistant. What could you want more from a small tactical flashlight? Never mind the minor flaws; we only take what’s good on this little flashlight: it’s small, tough, reliable and gives quite some light in the dark. When you take a look at the J5 Hyper V Tactical Flashlight – Amazingly Bright 400 Lumen LED 3 Mode Tactical Flashlight, the small size is what strikes you at first. The flashlight isn’t just small, but also quite powerful as it has a maximum output of 400 Lumen. We really like its compact design that makes it so easy to carry and to throw it in a pocket when on the move. You may choose one of the three operation modes, according to your needs: high/low/strobe. In case of an emergency, always use the strobe mode. Don’t let the small size of the flashlight fool you as this ain’t a toy to play around. The flashlight has a rugged build so it easy takes the more challenging missions. You may use it for typical outdoors activities (hiking, camping, and fishing), but don’t hesitate to also have it on you when going on a military mission. The grip is good and sturdy, no matter the weather conditions. You may even operate the flashlight with just one handed. 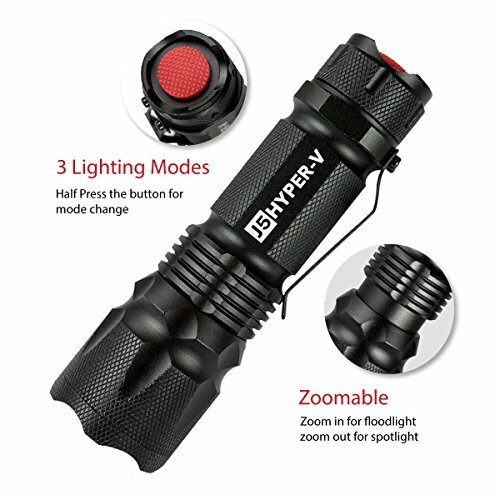 Another great thing about the flashlight is the fact that you may use three triple AAA batteries, which makes it both easy and cheap to replace them when in need. They run for a couple of hours when you use the bright mode. The light is bright and the focus is adjustable. You may zoom in and out when you want a more intense focused narrow beam. For the small size and dependability in many tactical situations, we still think the flashlight is a choice to keep in mind, especially if you go shopping on a low budget. 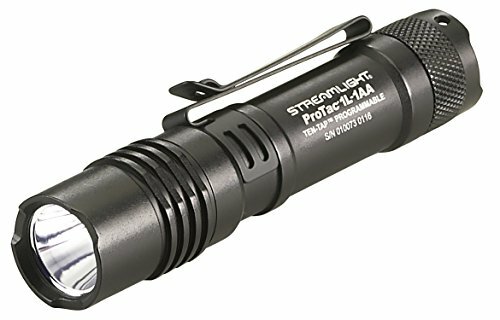 Small and versatile, the Streamlight 88061 ProTac 1L-1AA 350 Lumen Professional Tactical Flashlight is a little tool to have for all your challenging jobs out there. The flashlight gives 350 lumens on high mode, running for 1.5 hours with just one CR123A Li battery. You may use various operating modes in which case you may use AA alkaline, or AA Li battery. 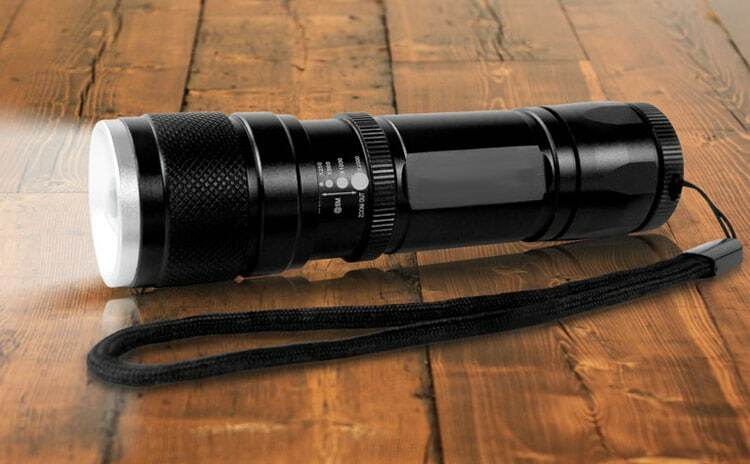 The rugged anodized aluminum build of the flashlight helps it take a few drops. The flashlight comes with impact-resistant borofloat glass lens that handle high temperature and shocks. They are AR coated and fit the durability of the flashlight. You may even submerse the flashlight as it has an IPX7 waterproof label. You may submerse it for 30 minutes to 1 meter. As for impact, the flashlight is built to take 2-meter impact resistance. The anti-roll face cap minimizes risks for accidental operations, whereas the reversible pocket clip is removable and lets you hands-free use the flashlight. The flashlight comes with pocket clip, nylon holster- all details that increase its versatility. As for the light modes, you may use one of the three operational modes: high/strobe/low, high only or low/high. Bright, dependable and versatile, the flashlight isn’t to be missed when completing your tactical gear. Small and compact, the Fenix PD35 2015 TAC Edition 1000 Lumen CREE XP-L LED Tactical Flashlight gives an amazing bright light and good stand in all sorts of tactical jobs. The flashlight gives 1,000 Lumen light when using the Cree XP-L (V5) LED that lasts of 50,000 hours. You may use one 18650 Li-Io battery that is easy to recharge, or a 3V CR123A Li battery. The tactical tail switch is functional and comes with momentary-on function. A low-voltage reminder informs you when it’s time to replace the battery. We also notice the reverse polarity protection that protects it when the battery is misplaced. The flashlight presents also an intelligent memory circuit and automatically enters last-used output mode when you turn it back on. The flashlight is made with long lasting aircraft-grade aluminum and presents a Premium Type II hard-anodized anti-abrasive finish. It has an anti-roll body design that is also slip-resistant. The glass lens is clear and tough, with anti-reflective coating. The durability of the flashlight doesn’t stop here and continues with the IPX-8 standard grade for waterproofness. You may safely take it under water up to 6 ½ feet for 30 minutes. The light has a good hot sport and nice flood. It’s very bright and so reliable. The flashlight is easy to use and is very well made. The minor flaws aren’t deal breakers for us and we still think the flashlight is a good small option to put on the list when in need to complete your tactical equipment. Even though it’s not the smallest option, the SureFire Defender Series LED Flashlights with Strike Bezel sure doesn’t take much space wherever you’d store it. It’s definitely a small tactical flashlight that doesn’t surprise with its tough build and amazing light. It has two output levels and you may use the 500 lumens high for the maximum light or the 5 lumens low for longer runtime. The TIR lens gives a tight beam, with good surround light for peripheral vision. The flashlight comes with coated tempered window that handles impact, without minimizing performance. The dual output tail cap click switch doesn’t just ease the operation, but also minimizes risks for accidental operation. The body is made with aerospace aluminum that is tough and durable. The strike bezel adds protection and the flashlight is Mil-Spec hard-anodized for more durability. The two-way clip design makes the flashlight highly versatile and easy to use in various situations. Metal to the pedal and don’t overthink it. The flashlight is tough and almost indestructible. Here is a selection of Surefire models.